Two years ago, I ranked my top ten favorite games, emphasizing that I expected the ranking to drastically change over time. I’ve been playing a lot of board games in 2015 (I’ve played 89 rounds of board games in 56 days; not too shabby! ), so I figured this was a decent chance for me to check in on my mental hierarchy of Dan’s Favorite Board Games. Either this requires no explanation, or an explanation will not suffice. It’s a game invented by our own Brian, and it defies simple description. I’ve only played it once, yet it lingers on my consciousness as a truly inspired creation, one I am envious of. (I really, really want to design my own board game… If only I had the patience and creativity required.) The in-depth history of Razor written by the creator himself is one of Earn This’s absolute must-reads, in my opinion. I’m not sure the mechanics inspire much admiration; it’s a complicated co-op game designed to screw you over and take four hours. But this is a worthwhile genre of board game, the kind you organize a whole evening around and invite all your friends to participate in. Kudos to Colton for doing an exceptional job running two rounds of the game and making it an absolute blast. I do hope to discover a game in this genre that more directly matches my taste in gameplay mechanics, but in the meantime, I’m going to enjoy every single Arkham evening that Colton (or anyone else) hosts. If you were making a list of your favorite ice cream flavors, would you include both “vanilla” and “French vanilla”? Of course not. Thus, I would have felt stupid including both Caverna and Agricola on the same list. The games have extremely similar dynamics (in fact, Caverna’s rule book has an abridged set of rule explanations for Agricola veterans to start playing for the first time in just a few minutes). Caverna has jumped Agricola to become #4 in the BGG Top 100 — the board game equivalent of the IMDb Top 250 — and it’s not hard to see why. Caverna is marvelously designed: it adds a bunch of dynamics to Agricola’s core, but streamlines the whole experience. There’s more to do and more ways to play. It’s gentler and easier to learn than Agricola, but has more variety. And yet… I never feel quite as immersed in Caverna as I do in Agricola. It doesn’t get my strategic juices flowing, doesn’t feel quite as deep or varied (thanks to the absence of Minor Improvements and Occupations), doesn’t keep me on the edge of my seat. In a vacuum, Caverna is an easy Top 10-er, but the game has the bad luck of having a sexier older sister. What the hell is this monstrosity? It’s easily the most complicated game I’ve ever played, with rules and mechanics that make The Cones of Dunshire look like Candyland. Our play sessions have averaged about 3.5 hours. And yet, I always walk away satisfied. It mystifies me: Everything fits together, but I can never quite predict how. It’s a riddle wrapped in an enigma wrapped in some sort of cancerous mutation. The premise of the game is really unique, and the game pushes its flavor hard — to great effect: You are a class of animal (mammal, bird, reptile, etc.) trying to survive the impending ice age. You manage your various species across the earth, propagating and diversifying and — yes — dominating. You select your actions in advance of each turn, then watch them unfold, praying to God evolution works in your favor. It usually doesn’t. Chess is a great game, perhaps the most competitive game in world history. It’s pure logic. There are no dice rolls or shuffled decks: Just you, your opponent, and 10 to the 43rd power possible board positions. It stands to reason that if you’re a grand master at chess, you’ve perfected the fundamental components of thinking and strategy. But you know what chess is missing? Lasers. Enter Khet. It’s a chess-like game: Two sides, pieces of varying power, no randomness, capturing opponent pieces and trapping their royalty pieces, etc. But instead of taking pieces by moving into their squares, you eliminate them by shooting a laser at them. You see, almost every piece in Khet is a mirror, and at the corner of each board is a laser (yes, a literal laser), firing beams into the mirrors. By moving and rotating the mirrors, you can zap opponents’ pieces (or your own if you’re not careful). I have an immense amount of affection for Khet — or “Laser-Chess” as we call it in our office. We frequently played the game once closing time passed, exploring the various opening positions and fervently discussing strategy. We even made use of the “Eye of Anubis” expansion pack, which adds splitters to the mix: Laser beams could now have multiple terminal points, adding layers of complexity to the game. …But in the meantime, our work after-hours game of choice is Race for the Galaxy, an extremely addictive card game. In Race for the Galaxy, you take the role of an adventurous space empire that starts with one small planet but grows by settling (or conquering) more planets, creating technological developments, and developing a productive economy. It’s a fun game, and it plays pretty quickly (30-60 minutes, including setup and cleanup), so it’s a great game for quick but deep strategy. For the longest time, I had two hangups with this game: 1) It’s too random, and 2) there’s not enough competition/interaction. Concern #2 was debunked simply when I played more games with the same people. Like many great Euro-style games, the strategy is not in directly affecting your opponent, but indirectly affecting them, which adds sufficient competitive edge to the game: You have to react to what you’re opponent is doing or risk being left behind. My other concern — that the game is too random — was rapidly addressed by the Race for the Galaxy’s expansion, The Rising Storm. The rulebook introduced rules for a deck-drafting variation on the game, and immediately my love for Galaxy skyrocketed, as the frustrating randomness (drawing good cards) was replaced with a strategically challenging randomness (drafting good cards). A few months ago, this might have landed outside of the Top 10 looking in, but today it’s cracked the list. I played Power Grid last weekend. It’s maybe the fifth or sixth time I’ve played the game, and the second time I’ve played with this specific friend, Mike. Moreso than other games, Power Grid becomes a game of intense intellectual concentration and hypothesis. If that sounds daunting or overly academic, don’t worry: You can just play the game, acting on whims, and have plenty of fun. It’s cool to expand your simulated infrastructure and win auctions. But it’s cooler to win said simulation by getting nerdy. The immense satisfaction of slaughtering opponents in Risk is one of the original reasons I fell in love with board games. But, as much as I hold it close to my heart as a forefather in my board-gaming passion, Risk is a highly flawed, often frustrating, game. First, players can get eliminated. If you get a few bad rolls, you could be spending three hours sipping beer and checking Facebook on your phone while your friends argue if Australia is “overpowered.” Second, there can be a lack of variety: If you invest in a strategy early, you could be stuck doing it all game, which could go on for hours. Third, many strategy purists would argue that there’s too much luck involved: The difference between winning and losing often boils down to who is rolling lucky. Fourth, it’s just long. It takes hours and hours to finish a game of Risk. Enter Small World. It has the same thrill of scheming and conquering territories with a much tighter design. Players are never eliminated, as they can choose to have their current nation “go into decline” and adopt a new one. Games are capped at a set number of turns so you’ll never have to pull an all-nighter to finish a playthrough. And the role of luck is minimized, as the basic conquering mechanism doesn’t require dice-rolling. What elevates the game from good to great is the variety: The nations you control are generated by matching a trait with a race, allowing for hundreds of possible nations that can play vastly differently: Merchant dwarves settle tiny but prosperous territories while commando ratmen live fast and die hard, quickly spreading thin across sprawling regions. I will forever have a soft spot for For Sale, as it was the second strategy board game I ever bought (after Settlers and just before Dominion and Ticket to Ride). Although it’s simpler than many of the other games on this list, that actually works in its favor: You can teach it in five minutes and play a complete round in fifteen minutes. Its gameplay is elegant and endlessly fascinating to play (even with the same people), as there’s a strong component of psychology and bluffing. The game is broken into two halves. Stage 1: bidding on property of different values represented by beautifully decorated cards. Stage 2: selling that property back to a volatile market, trying to reap a larger profit than your opponent. The first half of that has more strategy, the second half more guessing and luck, and it all blends into an addictive gameplay experience that I’ll happily repeat several times in one sitting. Many games rely on emphasizing one or two strongly-developed mechanic. Power Grid is all about the plant auctions; Ticket to Ride builds around a core of collecting and trading in matching cards; Small World refines territory-conquering to a beautiful science; Agricola perfects worker placement. Terra Mystica is probably the first game I’ve ever played that thrives by having a little bit of everything… and having it all somehow flow together seamlessly and with great balance. There’s the expansion and territory-grabbing on the map; there’s competitive scarcity for resources thanks to once-per-turn “power” actions; there’s direct competition (racing up the “cult” tracks) and indirect competition (carefully timing when your turn ends to try and be the next starting player). There are small, quick actions and long, thoughtful ones. Terra Mystica gladly gives you the kitchen sink, too. The biggest miracle of all is that it remains so balanced and competitive even with all this variety… and I haven’t even mentioned the 14 different species you choose from at the beginning of the game that each play completely differently. The more I play this game, the more of a masterpiece of game design it seems to be. Were you worried that no party games were going to make the list? 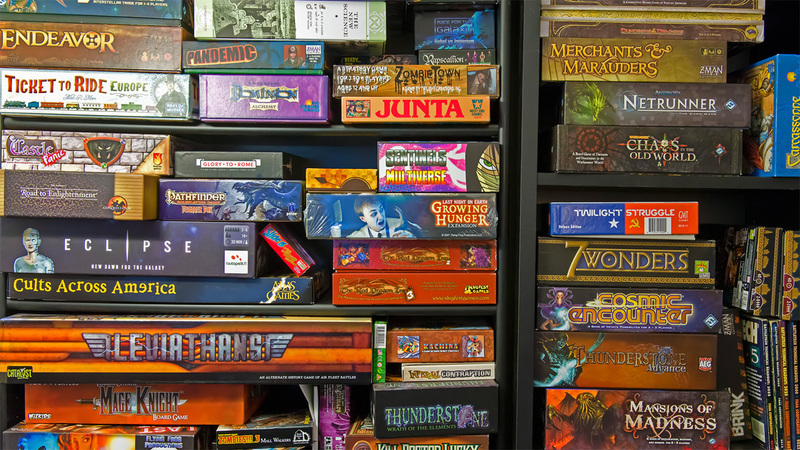 Every board game collection needs room for casual, friendly, non-strategic games. Whether you have a big crowd of people not interested in learning a dense booklet of rules or you just want to imbibe and socialize without worrying about heavy competition or intricate strategies, you need at least a few “pick up and play” type games. There are a few problems with most party games. If you’re playing something like Apples to Apples (or Cards Against Humanity), you’re stuck with a limited number of ingredients. Sure, you can pair “Helen Keller” with “senseless,” but the charm of the game runs low once you’ve seen all the cards. It’s even worse for trivia type games. Once you learn the answers, is there any need to play again? My favorite type of party game are the “creativity” games, where each player has to come up with something out of the blue. It’s almost like simulated improv. But there’s the problem: Not a lot of people enjoy participating in improv. Thus, you can have great games like Beyond Balderdash that only work with the right type of crowds. Another problem is that many of these party games trivialize the competitive elements. Point systems often feel arbitrary or tacked on. Granted, that’s part of the point of party games. But it’s still nice to have some sort of mechanism to evaluate who “won” whatever game you’re playing. In my mind, The Game of Things perfects the party game niche, addressing all of the usual flaws of the genre. And it therefore becomes an infinitely replayable game, working with almost every crowd, always satisfying. The premise is simple, even elegant: Each turn, players are given some sort of topic (or “thing”) of which they have to generate an example (example: “Things you don’t want your mom to know.”). Then, the players take turns trying to guess who generated each answer. Trust me, it’s more fun than it sounds. Because people are awarded points based on how well they guessed, the game rewards social deduction. But it’s also easy to just turn your brain mostly off, have fun, and be wacky. It works whether the crowd knows each other or not, whether they’re a particularly creative bunch or not, whether they’re drunk or not. It’s a party game win-win-win, and a game I tout as one of my favorites. I considered putting Dominion at #1 on this list. It hits basically all the check marks of things about games I love: Elegant, easy-to-learn design. Quick gameplay so you can play a round in a short sitting. Good balance of skill and luck (a lot and a bit, respectively). Sufficient complexity that the game rewards strategy, but sufficient simplicity that you can teach a newbie in ten minutes how to play. Ten expansions in — yes, of course I own all ten — Dominion continues to surprise and engage. From its simple mechanics have developed a tremendously complex and satisfying game.With hundreds of cards, each game is different, and there are effectively infinite different ways to play. Unlike “trading card games” such as Magic, Dominion is a “deck building game,” meaning all gameplay and card selection is emergent. There’s no need to spend time or money building a deck outside of the game: everything happens within the game; everyone starts with the same set of cards and builds their deck as the game unfolds. Perhaps the greatest praise I can give the game is this: It was one of the first strategy games I played, and it’s remained one of my two or three favorites ever since. I’ve been a Dominion fan for half a decade, and I still feel like I’m only scratching the surface. For a game to sustain my interest for that long, it has to be something special. In theory, the game is narrow. Develop a productive farm: Grow crops, fence animals, produce enough food to survive. But within all of that lies an astonishing complexity and variety. Want to develop a vegetable plantation? House a menagerie? Build an elaborate manor? Wheel and deal resources? The world is your damn oyster. Once you learn the rules, the gameplay is pretty straightforward: Each worker can take one action per turn, whether its accumulating materials or expanding the farm or planting crops or tending to the animals. Each player has somewhere between two to five workers to use each turn. Every couple of turns, you need to feed your workers. The more workers you have, the more feeding you have to do. By the end of the game, you should hope that your farm has cattle, sheep, and boar in its pastures, and wheat and veggies in its fields. It’s as simple (…and complicated) as that, yet the game has a cutthroat tactical element. Farms compete for scarce resources, constantly upgrading and optimizing to outpace opponents. A master farmer not only knows their own crops, but their opponents, and plans their next harvest accordingly. The reason I love this game is because it’s so versatile. Every game, you’re dealt fourteen cards from a stack of hundreds. Seven are “occupations” for your workers, seven are “minor improvements” to build at your farm. To win, you need to take advantage of these cards. If you have cards that reward boar-hunting… then breed boars. Agricola brings out my inner strategist, my inner warlord, my inner vagabond. I’m ready to steal the best improvements just a turn before you build them, ready to nab the resources you’re about to take. Want to hit the mines to get some stone? The fishing pond to get some food for your family? The well to wish for some luck? Tough luck; I’m one step ahead of you. Farming is a cutthroat business, so I hope you’ve come to play. Agricola is a pastime, but it’s also an intricate war machine. One where the difference of one cattle, one pasture, one grid of your house can be the difference between a prosperous empire and a bunch of begging, negative-point bums. It’s as simple (…and complicated) as that. May 18, 2015 in Games. 1. I played Archipelago once (I think with you, Patrick, and Katy), and it was okay but it didn’t really get me excited. It has interesting rules I remember. I’d play it again. 2. Settlers is a game that I wish I could have a fresh start on. I’ve had too many tedious, anticlimactic sessions. I always feel like I spend the majority of the game waiting for my turn as people unsuccessfully try to pawn off their sheep for stone. It introduced me to strategy board games, so I love it for that at least.